A lot of companies already use WhatsApp for their business, which is not completely surprising. Looking at the amount of users WhatsApp has, it is pretty likely that you can find quite some of your customers within the more than a billion WhatsApp users. On the other hand WhatsApp is still missing a business model, too, so it was time for WhatsApp to create a business specific solution. And of course, we are waiting desperately for an API to connect WhatsApp with thismo messenger business gateway! 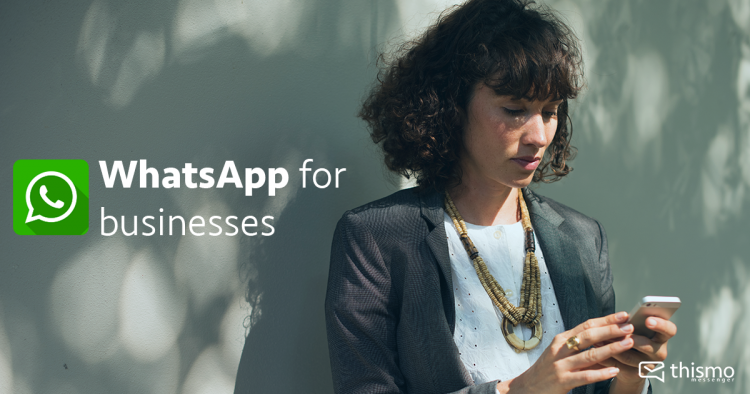 As reported on WhatsApp’s Blog, WhatsApp is likely to introduce a free business app for small to medium sized businesses to communicate with their customers. A separate corporate or enterprise solution for large companies with global customers is targeted at airlines, online retailers and banks. These companies will be able to use WhatsApp to connect and communicate with their customers and provide easy interaction and useful information. KLM Royal Dutch Airline already used WhatsApp for businesses as a participant of the test pilot. The customers receive their booking confirmation, a check-in notification, the boarding pass and the flight status via WhatsApp. Also, customers are able to send requests. The verified business accounts can be recognized by a green check mark next to their name. WhatsApp was always very cautious about preventing spamming their users. So, they will be having a close look on how businesses will use it. In order to avoid scaring their users away by being flooded with unwanted advertising messages. But customers also use other messenger like Facebook, Messenger or web chat. So, for companies it is important to be where their customers are. Business messaging definitely will be the communication tool in the future since the next generation won’t do phone calls anymore. Read more about the future of messaging for businesses!